by online teachings on November 29, 2012 in Bodhicharyavatara, Teachings. With video BA5_59-70 we come to the second shila or discipline: the accumulation of positive actions. 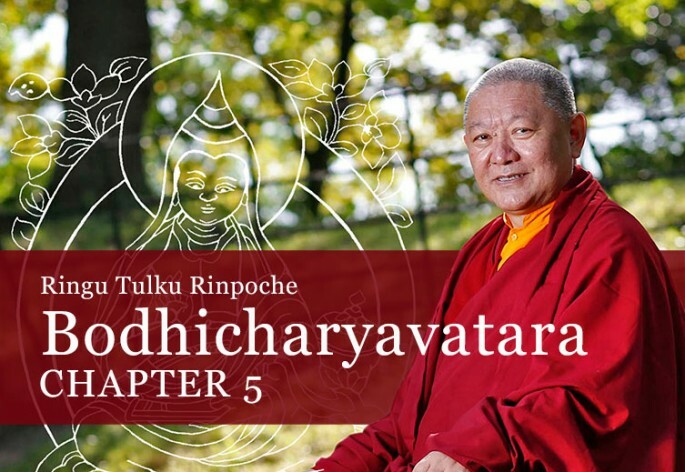 Here Rinpoche explains stanzas 59 to 70 of the Fifth Chapter of the Bodhicharyavatara, which are talking about giving up the attachment to our body and making it work for us in order to do more positive deeds for the long term benefit of all beings and ourselves. To view the video, simply click on the image to view all the Chapter 5 videos. If you prefer listening to the teaching in audio, use the audio player below. The audio as well as the audio translations in different languages and the transcript of this teaching are all available on Chapter 5 page. We are also studying the commentary transcript on Chapter 5, which you can download here and in the Library section. Further recommended reading: the commentary book by Kunzang Pelden (Khenpo Kunpal), The Nectar of Manjushri’s Speech, p. 182-185. You’re questions are most welcome. Please log in and leave your questions for Rinpoche as a comment below, or send them via email to studyquestions[at]bodhicharya.org. It is helpful if you can use one short paragraph and, if possible, less than 80 words. Any questions longer than that may have to be edited so please be concise. Questions will be collected from here on Friday, October 10, 2012, and included in Rinpoche’s answers video. After that date please send any questions relating to this video teaching via email to studyquestions[at]bodhicharya.org. If you would like to volunteer in making transcripts of Rinpoche’s online teachings, or in making audio translations to your own language, please email us at shedra[at]bodhicharya.org. Dear Rinpoche, thank you very much for this teaching on stanzas 59-70. It makes me think a lot about my attitude to my body in terms of hatha yoga practice; that is whether my attitude is based on attachment to my body and therefore is narcissistic (an over-concern with exercise to make my body in better shape), or whether it is disciplining my body so that it is better able to carry out beneficial work. I think it is probably a mixture of the two. Would a good way to lessen my attachment to my body in hatha yoga practice be to dedicate the practice to the benefit of all sentient beings and keep this in mind during the practice? Thank you for this very usefull teaching. Never before I saw my body as I do after this teaching. It is good for me(usefull) to treat the body as a servant, it is a good technique, very simple and quick, but…I do have a problem too. Ok…every time I start to aply this “new technique” I feel very happy and cheerful, but then it appears a sad feeling. It is like: “I am so lazy, that my mind needs a servant”. So now, Dear Master, I need another “technique” to transform the sadness in another thing. I am doing things for me and others, but I am crying a lot too. It is not good. Thank U for your patience & Love U! Dear Lama, thank you very much. Your commentary on stanzas 59-70 of chapter 5 is an eye-opener on how to make best use of the body as a servant of one’s good mind (settling in meditation) and serving sentient beings. Many times we heard and reflected in the ngöndro of and on ‘the precious human (re-)birth’, but it was -as I remember- never explained so well and distinctive- ‘guiding, using our body as a wish-fulfilling jewel…I might not have heard it before…and you’re teaching really came at the right moment… As I get older now also, living by myself, being un-employed…I tend to give in to ‘pampering’ the body more and more not really sure where and how to help…now…I’ve a ‘re-start’ and try to drop attachment and care and work as best as I can. Thank you for your precious, helpful and ‘healthy’ words. I’m sure, we’re all looking forward to your next teachings. Please allow me to add and ask something; while reflecting a bit on Rinpoche’s words and those of mine above on the precious human rebirth and how this relate to the body, I sort of realize that when Buddha speaks about the precious human rebirth…this mainly must concern our mind and it’s qualities, since even though it’s good to have a human body…because with this we can relate maybe best to other human beings…and other sentient beings too…How wonderful and precious would it also be if human beings could fly like the birds, swim like the fish, run like the antilopes, roar and jump like the lions etc. A bity like the Avatars:)…(even though they too needed strong birds to sit on for flying:) If we compare our fragile body with the animal body…it’s quite limited in a way also. Maybe therefore we can see in for instance Varjayana Buddhism (and Hinduïsm) how deities can have head like lions and bodies like (half) Bull’s, elephants, maybe eagles and so more….Rinpoche and sangha-friends…what do you think…is this to represent other strenghts and possibilities? is it interesting to strive for a more complete body…with more possibilities…Could Shantideva in a way…have set out a goal for that too…in order to benefit as much sentient beings as possible? Thank you very much for your time and patience:) to read and maybe answer and giving me possibility and time to reflect and have pleasure with the material. warm greetings,one woman in Holland.